Did you know that more than 50% of your website visitors tend to quit your site if it takes more than 3 seconds to load? Keeping your website page speed under check is a must if you want to deliver a good user experience. And one of the great ways to improve your current web page loading speed is by serving web pages that do not take up many resources. Compressing your images is one of the key factors that play a role in achieving that. WordPress is no doubt the best CMS available for bloggers. It offers a beautiful and flexible Media Library where it stores all the media files you upload. Now, when you are writing a post, you may need images for further illustrating your topic of discussion. Often we directly upload these pictures without checking much about the impact that may occur from its size. If you just add up five images in your post, each of 1.5MB memory, then, the whole page will have to consume at least 7MB of media files bandwidth before loading the post correctly. Firstly, Not all users have high-speed internet connection. When you are writing a blog, you need to consider users who are browsing on low speeds too. And for them, if you render images in their original size, they will be the first ones to abandon your website. It will drastically affect the user experience. Secondly, Your website will be using a lot of your server resources every time your web page is loaded. Now, imagine if 100+ users are visiting your site together. (100 is just a random value, I mean a large real-time traffic) This will lead to server overload, and your website can go down. Hence, it is important to optimize your server media, and keep your site running fast and smooth. Firstly, let me clear this. There are hundreds of Free and Paid Image Optimization Plugins which you can use to compress your WordPress Images. It covers a lot of necessary features which some similar plugins are missing. It has a free plan by which you will be able to compress 100 images every month. Now, considering you use five images per post, you can write up to 20 posts every month and use their plugin with ease. 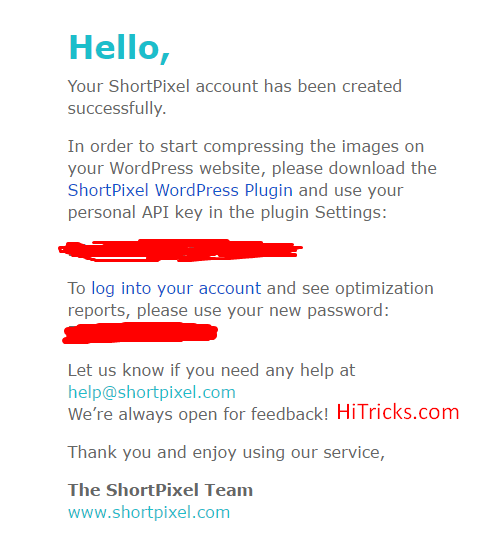 To use the Shortpixel Plugin, you need an API, which you can get after you sign up for free on their website. Enter Your Email Over there and Click Sign up. You will get an Email with your Login Password and API Key. Check your spam folder if you don’t find it in your main folder. First, you can just search for Shortpixel in the WordPress Plugin Directory from within your website. It is the most convenient way of installing any plugin. 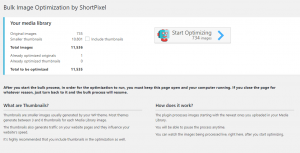 Second, You can visit this Page on WordPress Repository to download Shortpixel. Install the plugin like you install any other WordPress Plugin, and activate it. As soon as you activate it, you will find this screen. Enter the API Key you received in your email. And click on Validate. That’s all. You have successfully installed the plugin. After you have activated the Shortpixel plugin, you can now fine-tune different settings inside the plugin. Shortpixel offers 3 type of Picture Compression Modes: Lossy, Glossy and Lossless. Lossy Compression: As the name suggests, in the Lossy Image Optimization algorithm, some minor details of your images are ‘lost’ or removed to compress the picture. But don’t worry about the outcome. The details are so small that you won’t notice any significant difference with a naked human eye. Simply put, the image won’t appear as blurred. This compression method offers the best compression rate. This is the recommended way by Shortpixel. I will come about my feedback later on. Glossy Compression: This is somewhat a balance between the lossy and lossless compression mode. Shortpixel supports Glossy Image Optimization Algorithm. If you choose this option, the outcome will be almost pixel perfect with the original image. Notice the word ‘almost.’ Some pixels will be still lost if you choose this one. The compression rate is better than lossless compression, but not better than Lossy Compression. Lossless Compression: If you choose this option, the images will still be compressed to some extent. But you won’t lose any pixels. Your original image and this image will look exactly same, with just reduced size. This method is the least compression among the all. I have already discussed the three types of image compressions offered by Shortpixel. It is up to you which you want to apply. Shortpixel recommends the Lossy Compression. It offers the best compression rate. But I prefer the Lossless Compression myself. You might ask why. Here’s the reason: You know Lossless Compression does not lose any pixels, so it can be again brought back to its original image size later on if you want. The compression is completely reversible. Do you use Folder Zipping? Creating that zip file is a lossless compression, which can be unzipped later on. Lossy compressions are permanent changes. You can’t go back to the original image due to loss of pixels. Well, practically you won’t need a reason to go back to your original image, as Shortpixel is already taking up a backup of your original image and storing it somewhere else, but still, I prefer this. Moreover, the size difference between Lossy and Lossless Compression isn’t much. Lossless compression compresses the images a lot. Lossy compression does a bit further, which can be ignored if you want. And well, it depends on the user ultimately, it is a controversial matter. The decision is yours to take. Let’s check out the other features. If you are selecting Lossy Compression, then I recommend you turn on the Image Backup feature. It will backup your uploaded images into a separate folder. So that you can access the original lossless quality later on. This setting helps you to display images correctly on Mobile and Computer Web. I recommend turning it on. EXIF stands for Exchangeable Image File Format. In simpler words, Exif Tags keep information about the image stored in the image file, like when it was clicked, which device it was clicked on, etc. 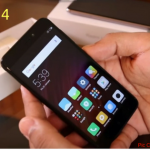 This can be useful if you are writing an article on a Mobile Review and posting camera samples of that particular phone. But for general images, you might not need them. In that case, you can turn it on. If your images are too large to fit in the desired thumbnail area properly, Shortpixel will help you resize it to the appropriate size. You can choose how it resizes the picture, whether to crop it or just reduce the size without cropping (may distort the image, though). That’s pretty much the initial setup you need to configure. Now Shortpixel will automatically optimize all the future images you upload to your website. WebP is an image format which is developed by Google, that involves a blend of both Lossy and Lossless compressions. It can reportedly compress a PNG image up to 45% of its original size. With Shortpixel, you can choose to create a WebP version of your images that will load much quicker. This is an advanced option, found under the advanced tab on the settings menu. Say you run a forum-type website where users can post new threads, or maybe a deals website where users can post new offers from the frontend. The images uploaded by them can also be optimized using The Frontend Image Optimization feature. This is also an advanced feature. And additionally, it also supports login and password for authentication in the frontend if required. If you run a website that provides Test Papers, Question, and Answers for Exams, Projects, etc., then you must be uploading a lot of PDF Files on your site. Don’t worry, Shortpixel can help you optimize them too. Also, if you display Retina Images, Shortpixel will offer you an option to optimize them, if you want. Shortpixel offers both Free and Paid Plans for your convenience. 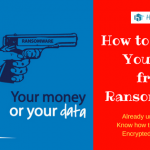 The first thing to note is that both the plans provide all services, the difference is just in the number of Images you can compress each month. Remember there are 100 Images per month limit on your free account. In case you need more, you can purchase additional credits from their website. Each credit offers you optimizing one image. You can either subscribe to monthly plans or just buy a one-time credit plan that never expires. It includes priority support for you so that you can get help whenever you need it. Check ShortPixel Upgrades from Here. 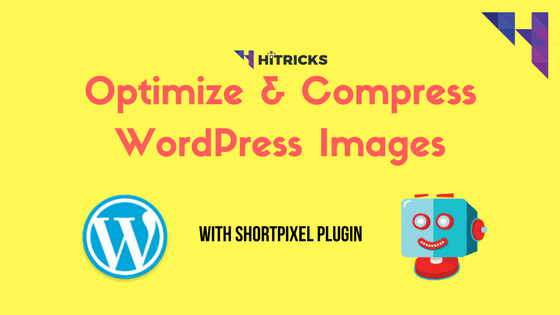 Shortpixel also offers a Bulk Image Optimizer Tool which may come handy if you already have images uploaded on your website and you want to compress them as well. The Bulk Image Optimizer can be found in the Dashboard > Media > Bulk Shortpixel Section of your WordPress Admin Panel. Note: If you are under Free Plan, then don’t use this option. Your free 100 credits will be used up if you try to compress your previous images. Check out our alternative free plugin suggestion at the end. Shortpixel does have an Online Image and PDF Compression Tool available on their website. In case you don’t intend to use the images on your WordPress Blog and use it elsewhere, you can take advantage of this tool and compress images online. Both individual compression and compression in bulk are available. Please note that compressing online also uses credits from your account. Shortpixel is otherwise a small plugin which you can use for free, but when it comes to using their Bulk Image Optimization Tool, you can’t use that without buying some credits. Hence, I am listing one more Free Plugin Here, which can by handy in case you need. So, if you are having a lot of images on your website and want a Lossless compression of all of them in bulk, you may try out Ewww Image Optimizer Plugin. It is a free plugin but does the bulk optimization task pretty well. By default it will do lossless compression, optionally you can set up lossy compression if you want. Well, Optimizing your image is just one of the many ways to speed up your WordPress Blog. You can try out the other ways to achieve even better speeds. Use a Content Delivery Network (CDN). Cloudflare is a Free and Widely Accepted CDN Service. It helps by serving content from a nearby server from the location your visitor is browsing from. So the requests take much lesser time to pass, leading to better page loading speed. Add up Expires Headers on your Website. They tell your browser how much time to store the cookies on the site. Don’t use excessive advertisements on your web page. And don’t display spammy ads on your site. That harms the user experience a lot. Finally, it’s time to write my verdict on Shortpixel Image Optimizer. 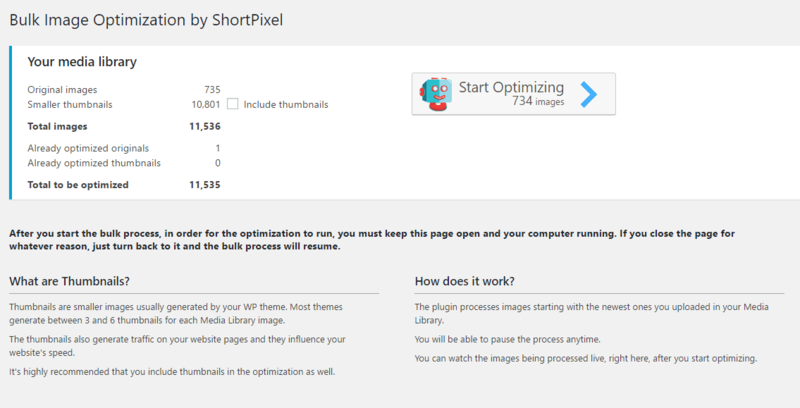 Shortpixel has all the necessary features you expect from an Image Optimization Plugin. The Automatic Image Optimization was smooth.The Quota of 100 Credits per month is quite standard according to me, and you will be finishing the month with a lot of leftover credits.The only thing I didn't like is that the Bulk Optimization feature, though available, you can't use it because it will eat up your free image quota every month. But every one of us needs to optimize their old images too, which means it will be necessary to either buy credits or use alternative plugins.Given the choice, whether I will be using it or not, I will say, at the current situation, I will be preferring Ewww Image Optimizer for Bulk Image Compression.However, If Shortpixel decides to give at least 1 Free Trial of their Bulk Image Optimizer Tool, I will be happy to use it. That will be actually beneficial for the users. So that was my review about Shortpixel WordPress Plugin. Thanks for reading. If you have any queries just drop it in the comment section below. I will be happy to help you out. And don’t forget to share this post with your friends. Use the social sharing buttons below. I will be back soon with another exciting update!